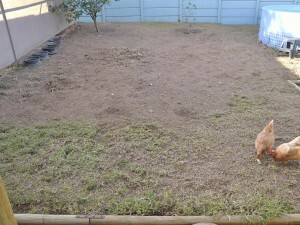 Home > Blog > Barbie's garden > Project Back garden starts! Hi Chris, hope you are enjoying your garden! 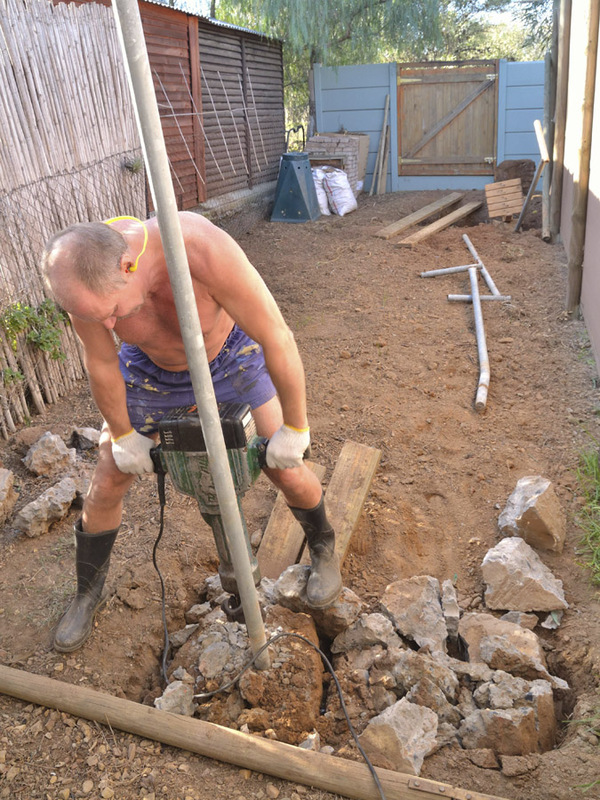 I have had a busy work week, but with a public holiday yesterday I took the opportunity to do some heavy work in the back garden and I managed to convince my wonderful (and muscular) hubby to help tear down the ugly washing lines I so dislike! I don’t think you even know this area because it is hidden from sight behind the shade cloth screen. It was not such a simple job as we both thought. 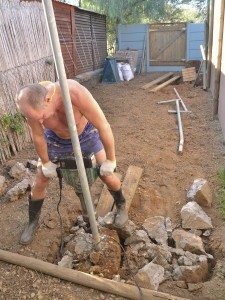 I had visions of us pulling out the small concrete “feet” the poles were set in and put the kettle on for tea! Well, we eventually had to hire a jack hammer – a zooper-dooper industrial one – to breakdown these colossal concrete beds to pick-up size chunks! Wow! I was amazed at the over-engineering to hold up a few washed towels and sheets …… and all that concrete you see in the foreground….there was just as much in the hole at the back (near the gate). Here is my strong-man! What would I do without him??? We finally pulled all the concrete out of the ground and now we have reclaimed a huge piece of garden that was wasted with this huge washing line. 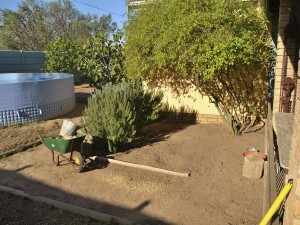 It must be at least 20 square metres worth of plantable ground! So now we are really and truly starting the back garden. I’ll keep you up to date on our progress! Some before photos – this is really a clean and virgin canvass to work on! A landscaper’s paradise! That’s how it goes usually with concrete. The things you want to stay upright don’t because they didn’t use enough (or any) concrete, and the things you want to get rid of end up requiring heavy equipment to remove. There was probably just a little bit of concrete showing at the top, right? At least you don’t have a buried swimming pool to deal with. I know a few yards in my neighborhood where people have done that. I feel sorry for future gardeners who live there. Hi Alan, I know you are right, but that is exactly what my hubby said. The buried swimming pool would have been the death of him. We would have sold and moved ….haaha!! Wow- that’s a lot of concrete! Whoever put that in wanted it to stay there! How exciting to have new ground to plan for, play in, and plant!